This post may not make very much sense. I just--as in 5 minutes ago--finished this book and I'm still trying to figure out what I thought of it. I don't usually read chick-lit, and I don't consider Jennifer Weiner to be a chick-lit author. She, however, does consider herself to be such an author so I guess she is my exception to my no chick-lit rule. I have read all of her books and liked most of them. As usual, I had this book on pre-order as soon as Amazon had it listed. If I did not have children, I probably would have read Then Came You in one sitting. I was able to read it over about 3 days, which is as good as it gets with me these days. Even though it held my attention, I can't decide if I actually liked this book! 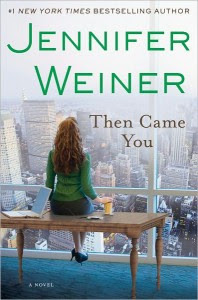 On the pro side of the Franklin list for this book, it is completely different from Weiner's other books. While she has wandered from her usual material in the past, she tended to fall a bit flat. Then Came You, on the other hand, is much more successful. It follows four women through the process of surrogacy. There is Annie, a young mother desperate to help her family financially, who decides to become a surrogate. Jules is finishing up at Princeton when she decides to donate her eggs for the money to put her father in a rehab program. India is an older trophy wife who is desperate to hold onto her marriage, and its financial perks, by starting a family. Bettina is India's suspicious and bitter stepdaughter. On the con side, while the characters were all well-written, I didn't feel at home, so to say, with any of them. Bettina was hard to like as was, for the most part, India. Jules was the most interesting of the 4, but she seemed to be the least involved in the main story line. I should have been able to relate most to Annie, but it just wasn't there for me. Still, this flawed quartet did work well together, if not separately. I do know some people who have gone or are going through some form of surrogacy. However, I can't say that I've ever thought that much about it. My guess is that, if one were to participate as either a surrogate or a donor, you would have to be able to emotionally distance yourself from the process. This story, however, shows how difficult that really is. The more I read it, the more I realized how difficult the entire situation could be (and how I would never be able to handle it). I just don't know what to think. The book held my attention, moved me, stayed with me after I finished, but it left me feeling uneasy. Maybe that was the intent? I would recommend this book in a heartbeat, if only to hear what others thought of it. I was not solicited for this review, nor did I receive any compensation.